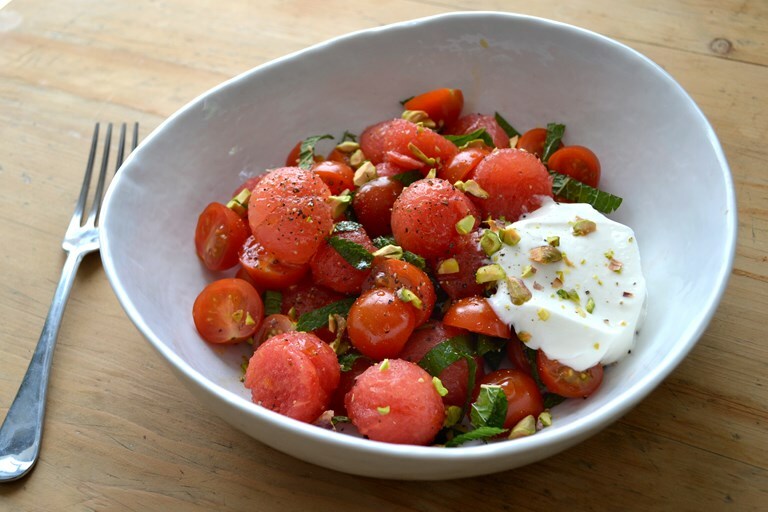 Food Urchin serves up a refreshing tomato and watermelon salad recipe, sprinkled with chopped pistachios for a little crunch. Serve the salad with goat's curd for a little tanginess, or if you can't get your hands on it, ricotta or quark would work equally well. A study came up with some alarming news recently. Having canvassed a cross-section of office workers, it was discovered that one in every six had had the same lunch, every day, for over two years. Now, these sort of reports in the media can be two-a-penny. Frivolous morsels that only really serve to raise your eyebrows for a fleeting moment before you get on with the rest of the day. But my god! If there is any semblance of truth in this, is it possible that Barry, your colleague of good standing since 2016, has been eating the same cheese and pickle sandwich, every day, for the same period of time?! The mind boggles. Because from where I stand, lunchtime provides the perfect opportunity to expand your horizons, explore new flavours and boldly go where no one has gone before. And I don’t mind making a huge display of this virtue. If it means lugging a huge watermelon, a punnet of tomatoes and a melon baller in on the train, I’ll do it. Life is too short to be trapped by repetition and the mundane. Besides, I need the exercise. The pairing of watermelon and tomato is by no means a strange combination. Both work well in salsas, a cool gazpacho or even as a sorbet. But due to their inherent fresh qualities, using them to knock up a quick, healthy salad is best. Especially on a hot summer’s day. 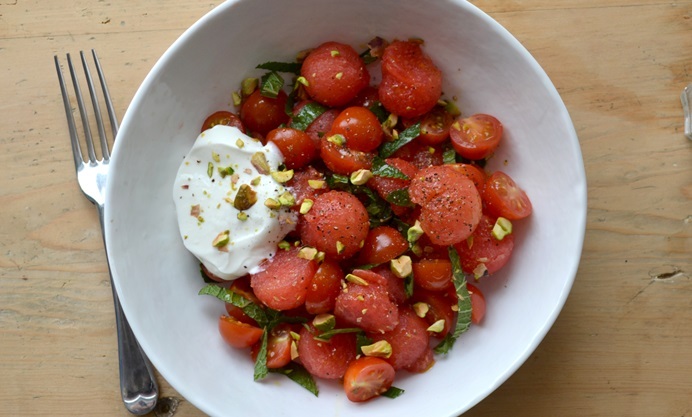 Because tomatoes and watermelon are naturally sweet and juicy, it is a good idea to go quite heavy on the seasoning with salt and pepper, to balance out things a touch. Adding a nice dollop of something sour is also a clever suggestion and for this salad, I chose some acidic quark. However, a scoop of ricotta or goat’s curd would really make this dish sing. The mint and pistachio sprinkled over at the end are also important, as they add extra vigour and texture to the bowl. And plus, it all looks rather theatrical. It might be best assembling this simple salad at home though, before coming to work. You don’t want Barry sitting next to you during its construction and getting all jealous now, do you?